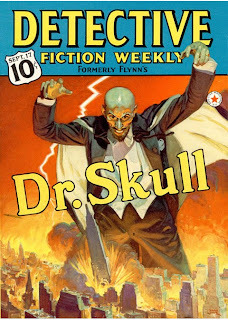 Detective Fiction Weekly by Rudolph Belarski. 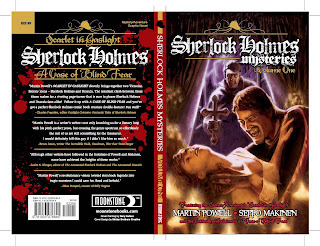 SHERLOCK HOLMES MYSTERIES Now on Sale! 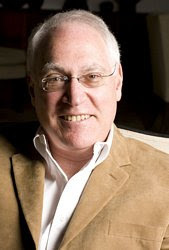 In October of 2008 I attended a special lecture by scholar Leslie S. Klinger, celebrated editor of The New Annotated Sherlock Holmes, hosted by the local Sherlockian society of Minneapolis. 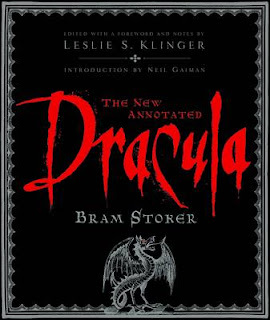 Halloween, my most celebrated holiday, was fast approaching and the esteemed editor was on a national promotional tour for his latest book, The New Annotated Dracula, which was also to be the subject of his lecture. I was writing The Evil of Dracula at that same time, and I expected an entertaining evening congenially compatible to the upcoming night of frights, nothing more. Something much more profound was going to happen for me. Leslie's informal, fascinating discussion of Dracula, Bram Stoker, and, inevitably, Sherlock Holmes was delivered with great wit and charm. 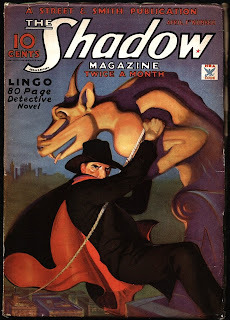 Then, suddenly, I felt an odd crawling under my skin when he began to talk about a number of existing literary works that mixed the Great Detective and the Vampire King together. Of course, I had written such an adventure in Scarlet in Gaslight, first published in the late 1980s. Imagine my surprise when Les further flattered, and flabbergasted, me by enthusiastically singling out my book before the listening audience. I was stunned. Completely floored. Was this some kind of a joke? Did he somehow know I was there? 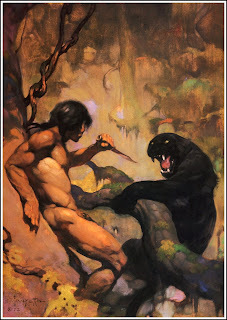 There was a buzzing in my ears, that must have been my pounding blood rushing through my temples. Lisa later told me that I looked upon the verge of tears. I simply didn't know how to react. I'd never had a public affirmation quite like that before, not to mention from such a respected researcher. That meant more to me than even the Eisner Award nomination that the book had received back when it was first published. 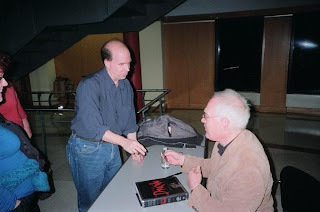 After the lecture, Les was directed to a table where the crowd could meet him and get their copies of his books autographed. I purposely waited to be last. I just had to thank Les for his kind words, and I wanted him to myself for a few minutes. When I introduced myself his eyes immediately widened, obviously as unexpected to meet me as I was to hear his praise of my work. We chatted about Dracula and Sherlock Holmes for a little while, and it became obvious that Les was very familiar with my other related books, including "The Season of Forgiveness", a somewhat obscure Sherlock Holmes tale that I'd written for an AIDS Research Christmas anthology in 1990. Happily we've since become good friends and, amusingly, Les admitted upon first meeting me that he was very surprised I wasn't British. When Moonstone approached me for a new double volume, combining Scarlet in Gaslight in its sixth printing, and A Case of Blind Fear in its fifth, I immediately asked Les to provide an introduction. I requested a new foreword from my original publisher, Dave Olbrich, formerly of Malibu Comics, as well. Both gentlemen kindly consented. At the eleventh hour, due to a complication at the printer, sadly neither of the new intros made it into the book. I deeply regret that, but it was truly no one's fault. 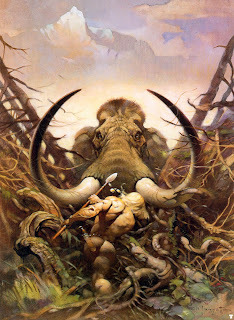 However, Leslie Klinger has graciously given me permission to post his special introduction here on my Blog. If Dave is also willing, I'd very much like to add his fabulous foreword, as well. Before turning this over to Les, I'd like to especially thank Joe Gentile, Publisher of Moonstone, who has been a champion of these books, keeping them in print for almost a decade. Also, I want to express my deep appreciation to artist Gary Carbon, who's brilliant cover painting transfuses rich new life to my twenty year old vision of Sherlock Holmes and Count Dracula meeting upon a mutual battlefield. PS: Thanks to Ray Riethmeir for providing me with the photograph of Leslie Klinger and I meeting for the first time. Sherlock Holmes (or a fair copy) has been the subject of comic strips, comic books, and graphic novelists for most of his life. Cartoons of Picklock Holes and his friend Potson, accompanying tales told by one “Cunnin Toil,” began in Punch magazine in August 1893 and ran occasionally for more than 20 years. A short-lived series about “Padlock Bones” appeared in Hearst daily newspapers in 1904 and Sherlock Gunk, an Eskimo detective, appeared in Rudolf Dirks’s Sunday tales of the Katzenjammer Kids in 1907. The series “Sherlocko the Monk” (later “Hawkshaw the Detective”) ran in the Hearst newspapers from 1910 to 1952, with several long absences. 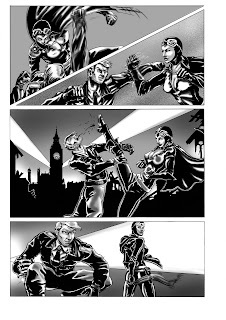 In 1930-31, a series of strips based on the original stories and drawn by Leo O’Mealia appeared in the Bell Syndicate (collected by Eternity Comics in three issues in 1990). In 1955, Baffling New Adventures of Sherlock Holmes was the first reimagining of the Canon. Perhaps inspired by the television series The New Adventures of Sherlock Holmes, starring Ronald Howard, the writers began to divulge tales that Watson had withheld from publication. 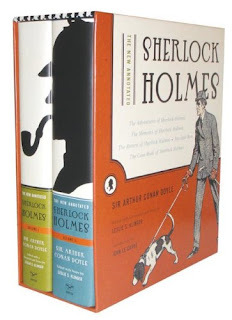 The effort was short-lived, however, and despite the general interest of the public in things Holmesian in the 1970's and 1980's, it wasn’t until 1988 that a serious original Holmes story appeared in graphic form. 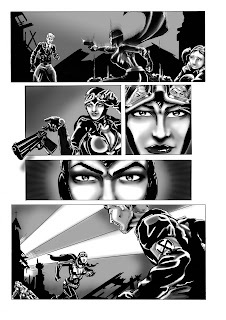 That work was Scarlet in Gaslight, reprinted here, and was quickly followed by A Case of Blind Fear from the same team. Although other writers have followed in the footsteps of Powell and Makinen, none have achieved the heights of these works. In 1897, when the tales of each were made public by their biographers, Bram Stoker and H. G. Wells, respectively, Holmes was at the peak of his career, fresh from his return to active practice in 1894. As you will see, however, Scarlet in Gaslight tells of a confrontation that, for reasons that will be obvious, must have occurred in 1891. A Case of Blind Fear is not set in a specific year, but in light of the amorous relationships that develop, I believe that the events took place in 1888. I’ve called Scarlet in Gaslight the best of the many imaginings of the meeting of Holmes and Dracula. A Case of Blind Fear returns to the spotlight a gripping story that has been sadly abused by comic film adaptations. Here are Holmes, Watson, Dracula, Moriarty, Griffin, Mary Morstan, and Irene Adler as you’ve never imagined them before. Enjoy—the game is afoot again! The AIR FIGHTERS Strike Again! Years ago, just as I was escaping the mundane horrors of high school, I happened upon an odd tabloid-sized book in a flea market that caught my eye. The cover was loose, so the dealer only charged me a couple bucks. This was The History of Comics Volume Two by Jim Steranko, focusing mainly on comic books that were published during WW2, and I read straight through all its ponderous, profusely illustrated pages in a single night. 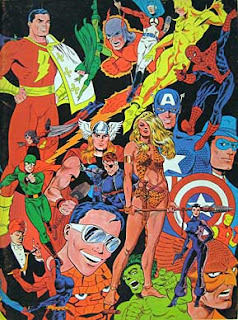 For the very first time, I was introduced to Airboy, Valkyrie, The Heap, Sky Wolf, Black Angel (that's her on the lower right of Steranko's cool cover), and many other terrific war-time characters. 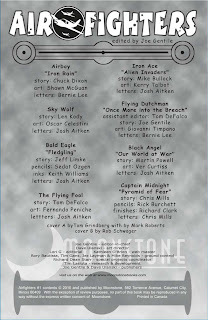 You can readily imagine my excitement when Joe Gentile, Publisher of Moonstone Books, told me of his plans to revive the classic Air Fighters comics and offered me the choice of a few characters still not yet spoken for. The moment I saw Black Angel's name, I knew she was the one I wanted, instantly seeing endless possibilities for her. Joe even allowed me to choose my own artist and again it was no contest. 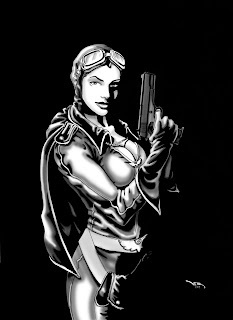 The superb Ver Curtiss was born to draw Black Angel. And so, this Wednesday, the Air Fighters return in a massive quarterly comic book anthology, loaded with 72 action-packed pages. I've already seen a number of these new war stories, and they pack a classy wallop. Here's the rest of the cast. Good eggs, all. Hope you'll join us! The sky's the limit! 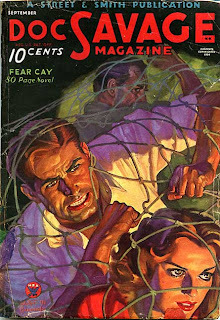 Doc Savage by Walter Baumhofer. 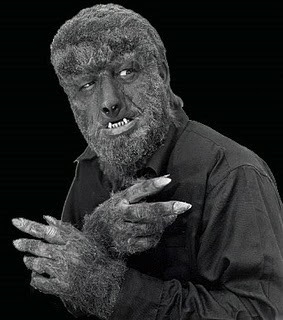 I was about seven years old when I first encountered Lon Chaney, Jr. as "The Wolf Man", and it was sort of a revelation to me. 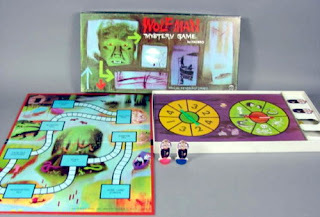 Something tells me that I must have jabbered on about the movie quite a bit, because that Christmas I received not only the classic Aurora Wolf Man model kit (my first-ever monster model), but also the cool and creepy Wolf Man Mystery Game. I remember staring at the box art from both of these for hours and hours, often trying to duplicate their atmospheric images in crayon. 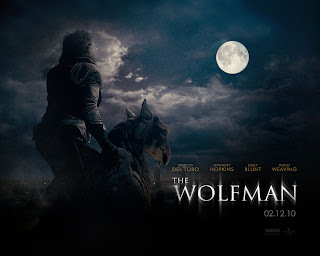 Last night, Lisa and I saw Universal's new film The Wolfman (transformed into only one word now), and I sat in jittery anticipation hoping that it wouldn't let us down. It didn't. I've read some perplexing mixed reviews, but Lisa and I loved it. 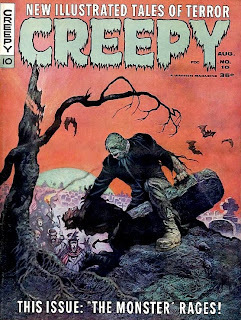 This is a real monster movie, inspired both by the original Chaney film and the tragedies of Shakespeare. 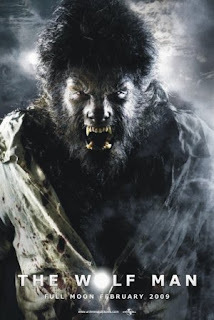 It also expressed several effective nods to Hammer's Curse of the Werewolf, which I especially appreciated. 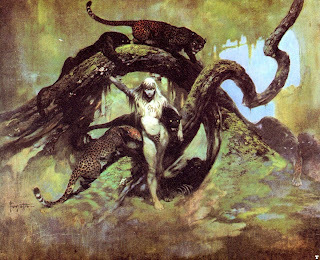 I even sensed a welcomed wisp of the ghost of the late Paul Naschy's Waldemar Daninsky, too. The cast is excellent, from Anthony Hopkins' cryptic Sir John Talbot, to Emily Blunt's tenderly portrayed Gwen Conliffe. 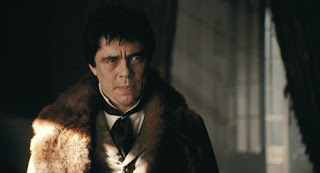 Simply stated, Benicio Del Toro was born to play Lawrence Talbot, a character who appeared in five Universal horror films in the 1940s, each time performed by Chaney. 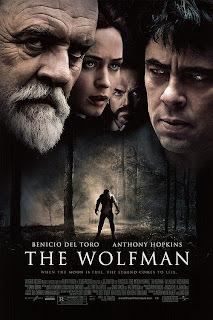 Del Toro, a serious Wolf Man fan and collector himself--as well as a co-producer of the new film--is a more than worthy successor, bringing a melancholy loneliness and ferocious savagery to the role. 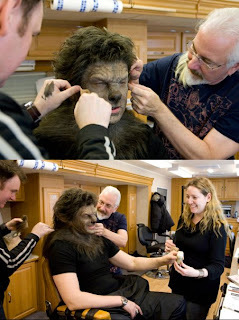 Perhaps, though, the real star of the movie is the fearsome werewolf itself, magnificently created by make-up maestro, and multiple Oscar Award winner, Rick Baker. 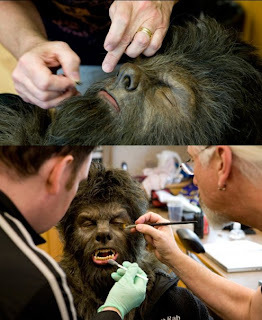 Although the Wolfman is still respectfully recognizable as inspired by Jack Pierce's classic design, never before has the creature been so realistically realized. I suspect it succeeds so well because we are seeing Del Toro acting in genuine monster make-up, not a computer-created effect. 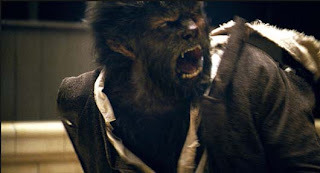 Personally, I found the new Wolfman as pitiable as he was frightening, and that's what makes a classic monster movie work. This is, arguably, the most terrifying werewolf ever presented on film and I feel it is Baker's finest horrific accomplishment. Bravo, Rick. 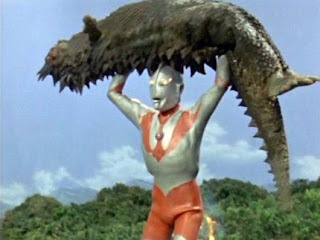 There is some CGI featured in the film, of course, but its generally applied sparingly, and effectively, during the transformation scenes which are swift, startling, and monstrous. 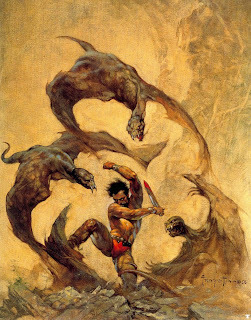 There are also some brief moments when the werewolf drops to running amok on all fours with furious speed, which are powerfully choreographed. The full Moon is especially ominously portrayed, practically a character in the film itself. 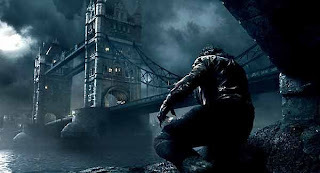 Late 19th Century London is moodily rendered, too, and what a thrill is it to finally see the Wolfman on the rampage through the crowded city streets! Mind you, this film isn't for kids. It's a full-blown, fast, scary, bloody, white-knuckled, fairy tale for grown-ups. 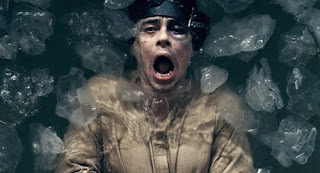 My favorite scene: the climax to the asylum sequence. You'll see what I mean. 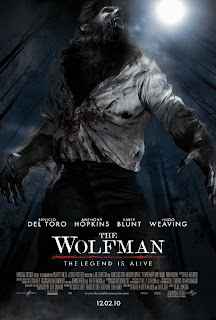 I can hardly wait for The Wolfman to arrive on DVD. I know I'll have to see it again before then. Highly recommended. Four out of five stars. 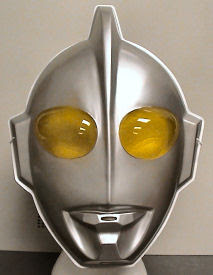 This awesomely cool Ultraman mask arrived today. Genuinely retro, too! When I was about eleven years old, a new independent television station, WDRB Channel 41, suddenly appeared on the airwaves in Louisville, Ky. Mind you, this was in the days before cable and VCRs, when we only had three local stations to choose from. For a kid like me, Channel 41 was the stuff dreams were made of. They showed cool old cartoons and vintage TV series, plus a great assortment of movies, from Tarzan, to Godzilla, and the whole Universal Monsters package. 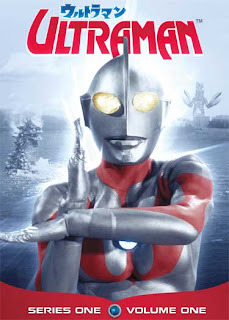 My favorite series, by far, was called Ultraman, a live-action Japanese sci-fi super-hero giant monster show. I'd never even heard of it before watching the origin episode, which hooked me before the first commercial. 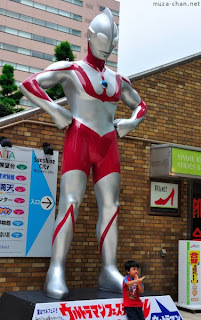 I became a fan obsessed, sculpting models, making masks, and writing and drawing my own Ultraman comic book adventures in between shows. 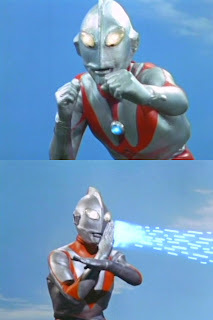 I dreamed of being a member of the legendary Science Patrol, and it was always fun to see the neighborhood kids race out of their homes immediately after the program, mimicking all of Ultraman's epic battle poses. Recently, I stumbled upon a DVD collection of the original series and I've become hooked all over again. Yup, I know exactly how this kid feels! Seven years ago tomorrow, I went on a first date with a sweet, smart, saucy red-haired artist named Lisa Bandemer. 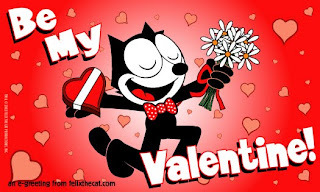 She claims to this day she was so cynical about dating and relationships then that she didn't even notice that I'd asked her out on Valentine's Day. That first date lasted about fourteen hours, so I suppose it's pretty obvious that we both felt a spark. A year later, to the day, we moved in together and it's been the two of us (and our four-legged familiars), through both tough and glorious times, ever since. Lisa was my salvation. She continues to be. 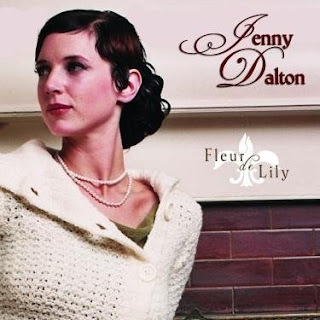 This past evening I spent a lovely time with musician, poet, and longtime friend, Jenny Dalton. 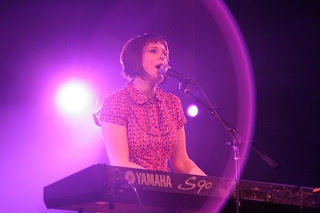 We've been friends for almost ten years and it would be remiss of me not to make special mention of Jenny in my blog. Both of us are agnostics, often suspecting everything while, perhaps, believing in nothing, raised in traditional, somewhat strict Catholic homes. We've always shared a peculiarly similar world view, which drew us together in the first place. She introduced me to the fascinating works of Robert Anton Wilson, and I gave Jenny her first deck of Tarot cards. I wasn't exactly sure why I did that at the time. I don't believe in the Tarot. But then, I don't disbelieve it either. By way of splendid coincidences (? 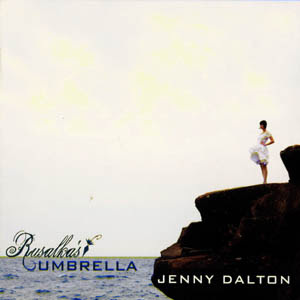 ), Wilson's books profoundly affected my life, while the Tarot set Jenny on a vigorous new path of creative freedom and self-discovery. Simply put, our lives wouldn't be the same had we never met, and we've been a positive influence on each other ever since. 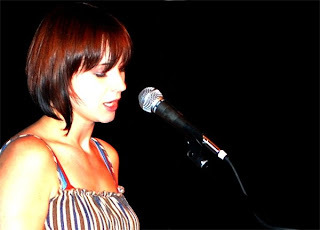 A mutual fan once remarked to me that she felt Jenny and I "wrote from the same place." The comment was definitely meant to be a compliment, although I didn't understand it. Jenny and I discussed this tonight, and it immediately seemed to puzzle her, too. Still, I can never resist a mystery, so perhaps Jenny and I should write something together one of these days, then we might be able to figure it out. I'm certainly game if she is. Currently, she's about to immerse herself into the studio and begin recording her next album, which sounds truly amazing. You'll be hearing more of Jenny soon. Stay tuned. You'll have a lovely time, too. 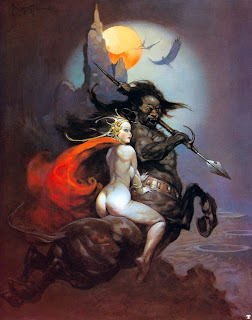 While I was growing up and immersing myself in the fantastic worlds of Edgar Rice Burroughs, no other artist captivated my imagination quite like the one and only Frank Frazetta. It's safe to say, I think, that I wouldn't be the writer I am today without Frank's iconic influence. In fact, I suspect that many like me wouldn't have had careers without him. 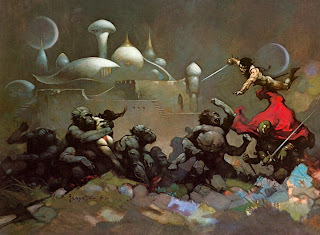 I don't consider it an exaggeration that Frazetta created the current fantasy/adventure genre that I've enjoyed contributing to for over twenty years. So, Happiest of Birthdays to you, sir. Your brush burns brighter today than ever before. JOHNNY APPLESEED Now on Sale! 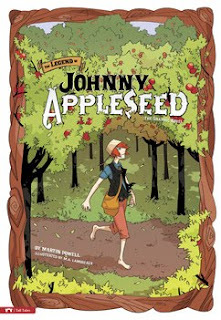 My new children's book, THE LEGEND OF JOHNNY APPLESEED has been published by Stone Arch Books, and is now on sale! It's a beautiful book, lovingly illustrated by M.A. Lamoreaux. Makes a great companion volume to my new THE TALL TALE OF PAUL BUNYAN book, too. Hmm...Guess this is my first biography, since John Chapman really lived. Anyway, I loved writing the book, and I'm very excited to see this in print. The library edition, with its hardcover binding, is gorgeous.